Teacher Didi Holt works with a small group of students at the Biddeford School District's Alternative Pathways Center. This is the fourth story in the weeklong series "Finding A Way." Janie could easily have abandoned her hopes for a high school diploma at any time over the last few years. The senior, who asked us not to use her last name, says she lived all over the place growing up, never settling. “Washington and Florida, Mississippi, Ohio. I was born in Ohio. Just different parts of Maine. I lived in Kentucky. A lot of places,” she says. When she was 14, Janie says her mom moved again without much explanation, and she was left in Maine, largely on her own. She couch surfed and found temporary spots with family and friends, but medical issues compounded the problem and left her mostly unable to go to school or work. "I wasn't really attending enough for them to count me as being in school, but it was never my intention to drop out and just not go to school,” she says. “I wanted to. I just didn't have the means to come here." 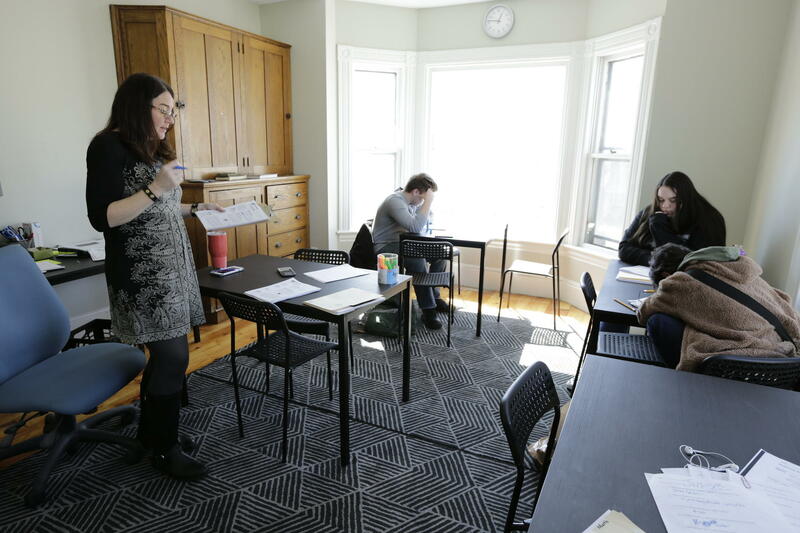 Last year, she enrolled at the Biddeford School Department's Alternative Pathways Center, where many of her classmates have also experienced trauma. One thing that is different about the center is that it stands alone, about a mile away from Biddeford High School. It occupies the first few floors of a renovated old house. There are only 40 kids, as compared to more than 700 at Biddeford High. There are a few teachers and support staff, all split amongst assorted classrooms and offices. Senior Shayy Torres says these one-on-one relationships have helped her to feel safe at school. Teacher Stephanie Jackson leads a small class discussion at the Biddeford School District's Alternative Pathways Center. Students have been referred to the center by friends, school staff or outside agencies. They meet with the teachers here to see if they are good fit, then sign a contract agreeing to behavioral and attendance expectations. Teachers also craft a "personal learning plan" for each teen based on their needs. Some work in a traditional classroom and others perform more hands-on work in the community, making bikes or working in a wood shop to help them earn credits to graduate. “On a structural level, we really try super hard to find any way for them to be successful,” says teacher Stephanie Jackson. Jackson says the flexibility is important to encourage students to come to school, even with a full-time job or other significant responsibilities. "So, you can only come on Tuesdays and Thursdays because you got to work a job. What if you do this, and this, and this, in those times?" she says. "It's trying to get a plan for each kid. Letting each kid know they have their plan. That they're going to decide what they're going to do and not going to do." The strategies are not entirely unlike other alternative programs in other high schools across the state. But one thing that makes this program different is the vision of its director, Martha Jacques, who is also a licensed social worker. She meets with each student regularly and helps to connect them with social service agencies. The school even offers a small food pantry and washer and dryer on campus. 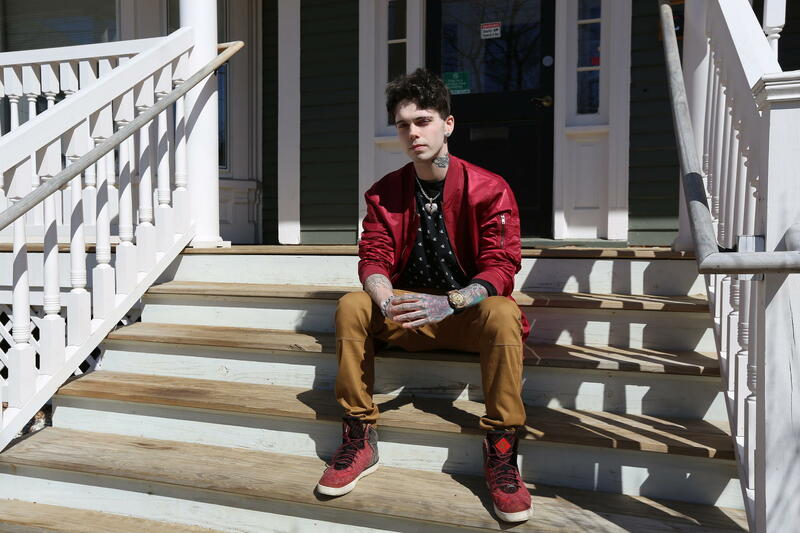 Kyle Ricker got into trouble as a teenager, including dropping out of high school and spending time at the Long Creek Youth Development Center, but received his high school diploma after enrolling at the Biddeford School District's Alternative Pathways Center. Two years ago, when Jacques was hired, she saw that many students were working full time jobs or spending many hours a week on counseling and other intensive mental health supports. She did not want school to interfere with that work, so, with approval from administrators, she created a program allowing students to receive school credit for doing it. "I just felt like it was important,” she says. “I felt that if a student is willing to do work on themselves as a 16, 17, 18 year old, that will likely help them be a more successful adult. And that's important to me. It's important to help these kids have tools that they can carry with them throughout the rest of their lives." Last year, the district allowed Jacques and the rest of the staff to debut their revamped approach. Jacques says the results surprised her. "We went from attendance rates of 63 percent to attendance rates of 89 percent,” she says. “We had 19 kids graduate last year. We have 26 kids that are going to graduate this year. Students come to school. They're here. They want to be here." Connor, a junior, says he basically did not go to school during ninth grade because of family unrest and dysfunction. 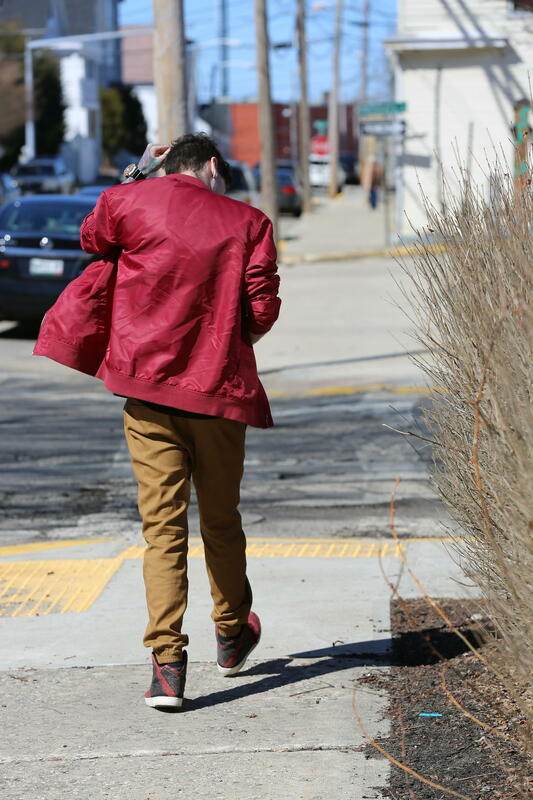 “If Biddeford didn't have this school, I probably wouldn't be going to school,” he says. He says that this year, he has grown to trust the staff and even made the honor roll. Jacques hopes that these kinds of stories, and the experience in Biddeford, can show other districts the value of investing in needs beyond the classroom. "Of course it comes back to money,” she says. “I think that basically, it's a 40-to-1 ratio for social worker to students, is fantastic. The fact I can meet these kids where they're at, be here and available for them," she says. "To really help them be at a baseline place where they're open and willing to learn, is important." Programs like this cannot respond directly to the root causes of poverty, substance use disorder and homelessness. 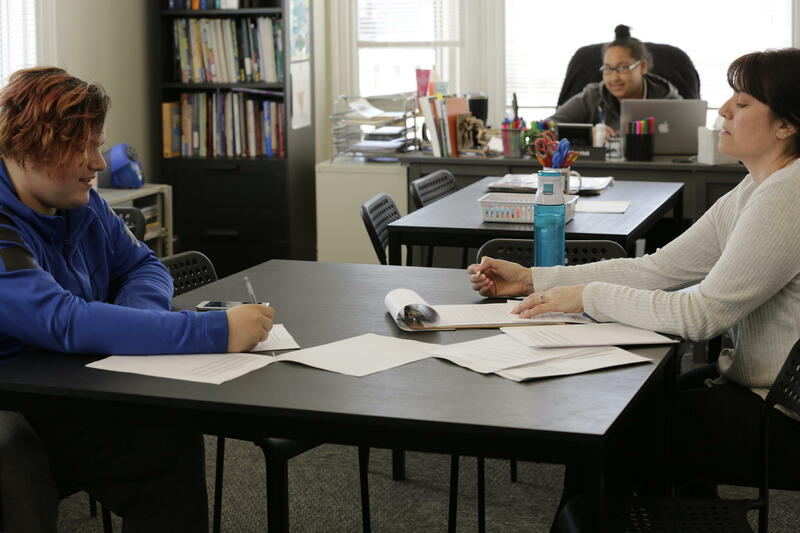 But even with limited resources, some schools and social service agencies in Maine are finding a way to help kids overcome those challenges and perhaps to find success as adults. Maine Public's reporting on issues affecting teenagers and young adults in Maine is made possible with support from the John T. Gorman Foundation.